FREE SHIPPING - U.S. orders of $75 $49 or more! 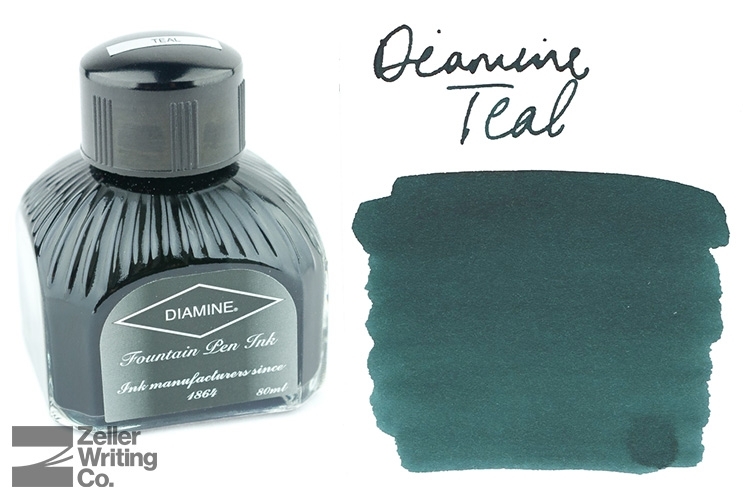 Diamine Teal fountain pen ink in an 80mL glass bottle. Quantity discounts available! Order 5 or more eligible bottles of ink and receive a 5% discount. Order 10 or more and receive 10% off! Below are the characteristics provided by the manufacturer. Founded in 2012, The Zeller Writing Company began as an outlet to offer handmade woodworks from the Zeller family but quickly grew to be a destination for writers and enthusiasts in search of analog writing supplies and a resource for those looking to improve their craft. Subscribe to our newsletter for periodic updates on ZWC happenings. Copyright © 2014 Zeller Writing Company. All Rights Reserved. Built with Volusion.